Today twofour54 held a very useful and exciting mobile user experience (UX) training session with the presence of David Ashford of Apps Arabia, Magnus Nystedt Group Editor at the Corporate Publishing International (CPI), the publishing house that brings pcworld and macworld Middle East. And the main speaker was Oliver Weidlich of Mobile Experience: Director of Design & Innovation. After launching their Android app the well known Angry Birds game generated $1m from advertising alone. Apps Arabia have already launched one app on the iPhone, “Kalimat” which translates to words in Arabic. Plus 3 other apps in the pipeline which are Finjan, musicfn and a application targeted to kids which with the name wasn’t disclosed. Main point that was repeated through out the event was that all developers should think about their consumers and what their needs are. Five things to consider when you are choosing your platform: Market size, Distribution, local currency, operator billing and commercial. from the (unclear) image above it lists the platforms starting with Android at the top, iOS, Blackberry and Nokia. 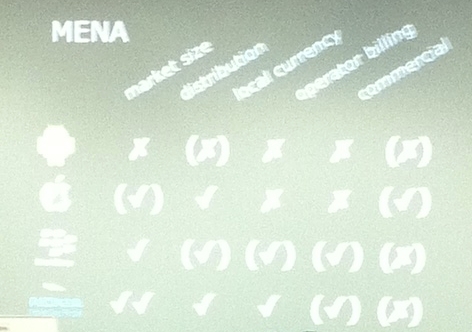 The check marks and the “x’s” indicate if they are available in the MENA region. Now for the Blackberry Appworld it was said that the market will be available in the UAE very soon and it will support local currencies. From a business or investment point of view, developing Android apps is not interesting for Apps Arabia since the Andriod Apps market is not fully open in the UAE, only the free apps are available in the region. Next up was Oliver Weidlich, who gave a very insightful presentation on creating a great user experience and how all their work was based on a technique called User Centered Design or (UCD) I will talk more about this later on this post, however Oliver has a great deal of experience with developing mobile, tablet and even touch screen applications. They all follow the same process but each medium has different strengths and weaknesses and as a developer you should keep those in mind depending on what you are designing for. A very important note that was also repeated that developers should not develop applications they want to use, they should develop apps that solve your users needs! They are always close to their users , Oliver mentioned a study that was done by placing a bluetooth device on the user that was tethered to the phone and it was found that people always keep their phones within a distance of a couple feet away from them. Surely they might flash their phones around but they will rarely ever share their phones with anyone. To sum up the points above Oliver gave a very good example, lets say a user had meeting to attend, the app would know the user’s current location, and according to the time of this meeting the app suggests that the user should start moving because his direction is currently going to be moving in traffic because so more time should be given on the road. After that introduction on mobiles and apps, Oliver went it to discussing the key factors of great UX design and why it is needed. He states that apps are no longer just apps that are downloaded on users phones they are apps that enriching their lives and making their daily lives easier. Useful: Developers should always separate themselves from their target Audience. (The app should for their needs and not yours!). The more useful the app is the more engagement it will create, it will have to achieve goals either faster, easier or provide a better result than other existing apps. An example was given instapaper an app that provides a better, easier more convenient way to read your articles. If you read several articles and have multiple tabs open in your browser you can send them to your instapaper account where they are saved for you to view later and from their you can access through your mobile, table and you can also share the articles directly on social networks from your instapaper app. Usable: Simply your apps as much as possible, make them easy to use and keep in mind of peoples mentalities. users have an expectation of how things work so try not to re-invent the wheels if things make sense for users to do it in one way try to take advantage of that factor. A good example to explain users mentalities is when people enter a restaurant, they expect to see a host/hostess to seat them their tables and then a waiter comes and asks if they would like to drink anything, after that the comes the menu and then they can order, a waiter wouldn’t get their order before they get the menu! Also always try to use labels and language that users will understand, don’t use labels that you and your friends use when everybody else know it as something else. 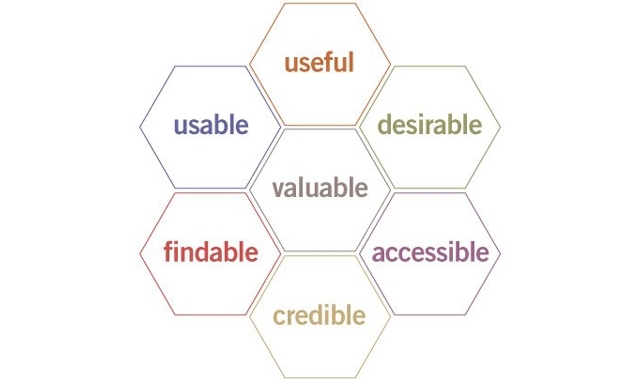 Desirable: Go a step further beyond the user’s expectations this will make the make more desirable since it will provide an extra reward feeling with the consumers. For example you can make the experience a playful one (where appropriate) an example was given from the Nokia Beta Labs where they are trying to make unlocking the phone a bit more playful by adding bubbles to the home screen and each bubble represents a function (messaging, browser, etc.. and when the phone unlocks it directly opens the function of the chosen bubble). Another example shown was from TAT where the design very playful in app designs and movements. Value: People will download your app if they see value in it. It has to have an added feature to the normal service provided elsewhere. Oliver displayed the Square which is a device that attaches to the top of an iPhone and can make credit card payments easily using your iOS, this is useful for vendors who do not have access to credit cards readers or don’t want to pay regular banking charges for such a small percent of their customers who pay in credit card this way they are only charged by purchase. The app also goes an extra step by providing aid in managing inventory and seeing when different items are being purchased. Findable: Make sure you market your app well and correctly, for example if it is a card game it should be under games > Card games. the categorization is very important to make it easier for users to find your app. Also utilize social networks and your website to advertise your app. Accessibility: This should be accessible for everyone and not just for users with disabilities. Credible: At the end of the day people have to trust you, your brand, your reputation and you distribution methods. This is key to having a good app. After that Oliver went to explain the UCD method, which is what they use in their labs to produce a better UX. It is an approach to research and design by involving users throughout the process at every step and milestone. It helps in creating great UX by putting the focus on the user which is going to be the end user (of course the user should be from your target audience). UCD is an adaptive process that changes according to feedback at different milestones, this helps in scoping projects in a better way reduces costs because changes are being done on the fly and not waiting till the end product is ready and therefore changing the entire code from scratch. If UCD is not followed apps end up being developed answering your needs and not your users, so make sure to get it right because unlike websites you can’t get away with a bad UX design for a mobile app. A very important note to keep in mind is that users often can’t articulate or let you know exactly what is wrong for a number of reasons, mostly it is because they don’t have anything to compare it to and are not aware if it can be done better. A good way to solve this is to provide them with different options and see how they interact with each option and get feedback from them, you might end with a 3rd hybrid design of the 2 options. You have to know that feedback is sometimes very valuable and a lot of times not very useful at all, so you have to know how to balance and use what makes sense. Concept: This is the fun part where you can brainstorm ideas, identify platforms, create user journey mapping (this is like a storyboard for the user’s journey), and see if you can utilize or develop for other platforms to make the app more of a success. Design & Refine: In this step you start getting designs reviewed by experts (remember these experts are not necessarily your target, even if they try to put themselves in your target’s place they will only give you feedback according to their experience which should be more cost effective at this stage than testing out with great number of people.) You can also carry out usability testing and Guerrilla testing which means place any person that fits your target audience profile and ask them for feedback (And don’t take it too personally). A good tip that was given is that make your life easier and use templates and stencils this will help in standardizing designs in case a big team is working on an app. And this will also save a lot of time for you to think of the bigger more important issues. Development: Here the same activities from the previous step still have to continue, feedback from experts and users. And always make sure to give plenty time for usability testing. Because if you do get feedback you will require some time to make adjustments. Launch & Monitor: Launch the application and always keep monitoring the performance, see where there are drop off points. And go back to your list of goals you set during the research phase and revisit the goals you’ve placed to measure the UX performance. When carrying out changes or adjustments to your app, don’t expect users to quickly adapt to those changes. They are most probably still used to the old one and might be resisting slowly to the new updates so be patient. Make sure to monitor how user behavior is changing over time. App Definition Statement: This is what the iTunes suggests, which basically lets you put in prespective to design the app for the device and make sure its tailored to the task at hand so that you can prototype it and iterate as needed. Scenarios: Use scenarios to see how different personas might interact with your app. You will find that some persona will not necessarily act alike in the same scenario. Focus Groups: Groups of 4 – 6 people per group and make sure to segment your groups in which people from the same background are grouped together to get richer feedback. For example if you have an application that is geared towards business professionals, you might want to place the younger crowd together, then the experienced people together and then finally the ultra successful people together. Customer Interviews: Conduct 1 0n 1 interviews with your target. Contextual Inquiry: This is where you interview the user in their usual environment while using the app. It could be during the day or in the office and so on. This will lead to a better result of feedback since they are not pressured to feel that they are trying testing out something. Prototype on Device: Make sure to use things in their place and how they will appear on the platform you are designing for. There is no point in printing out the designs and making them bigger so that users can view them. It has to be on the device to get proper feedback. After that the discussion was moved along to the UX design for tablets, which usually follows the same process above, but you have to always keep in mind the different usage behavior as well as the different strengths and weaknesses of different platforms. For example a story that was shared about how tablets can change people behavior, was when Oliver and his business partner went to meet a client. Oliver had an iPad lying flat on the surface of the table and his business partner had a laptop. At the end of the meeting their client realized that he spoke and interacted more with Oliver than his business partner because there was a screen in the way kind of interrupting the conversation. The way the tablet is held, where is the interaction area with the device? Finally Oliver touched on designing for touch screens and how the same process can be applied to those as well, especially the tips form designing for tablets. For wireframing tools check out: www.amirkhella.com and www.redfoundry.com they offer great resource for the iPhone and iPad.